For maybe the second or third time in my life ... I walked out of a movie yesterday. Alice in Wonderland 3D was so boring, so dark (the picture ... even more than the plot), and those stupid 3D glasses gave me a headache and made me want to throw up. Other than that it was just fine. 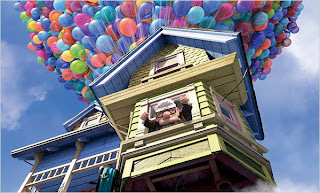 However ... there is a movie that I think deserves to be mentioned again and again as the best picture of the year ... Up. It's not the same kind of movie as Precious or Hurt Locker ... it's better. Okay, maybe I'm not the sophisticated movie critic that some proport to be (or not to be ... that is the question). But this is truly one of the best movies I have ever seen. It will make you feel great. There ... I've said it ... Don't ask ALICE .... Get UP. I enjoyed the move UP, my daughter fell asleep. Go figure. 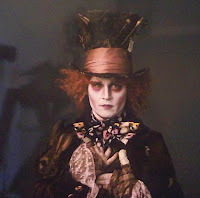 Just saw Alice tonight, wasn't that bad, but could have been a lot better. Was just expecting more from Tim Burton! Loved UP! Ah, movies that make you smile are definitely worth an hour and a half of your life! @ Virginia ... LOL. My kids are older now and usually I'm the one who falls asleep! @ Betty ... Glad you did! @ Annika ... I expected more from Tim Burton too. Totally agree with the smile factor. I'm not at all into animated films - but UP was on while I was at the gym one afternoon. I loved it, my eyes teared up I was that memorized. I think I stayed on the treadmill for over an hour just to continue watching the movie!